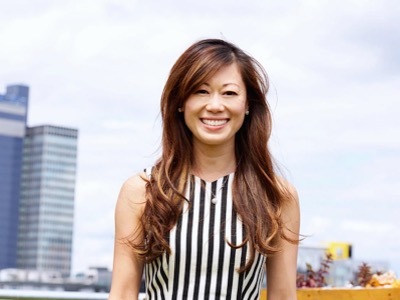 Michelle Hua – co-founder of Women of Wearables and founder and CEO of Made With Glove and Marija Butkovic, co-founder of Women of Wearables and Kisha Smart Umbrella share their career journeys and why they decided to launch Women of Wearables (WOW). Michelle: When I was working remotely as a lawyer for the Western Australian Government in Manchester, I rented a hot desk at a co-working space. I was surrounded by other entrepreneurs and their passion for their business, their self determination and motivation inspired me to resign from my job and start my own wearable technology company, Made With Glove. After 2 years, I met Marija at the Wearable Tech Show in London in 2016 (who is also in the wearable tech industry) and we co-founded WoW. Marija: Same as my co-founder Michelle, I was working as a lawyer for 8 years, before tapping into startup world. It all started as becoming a startup mentor, tech journalist and when I started organising hackathons for Croatian startup community. I soon realised it offers me much more creativity and independence than working 9-5 in a stuffy office, so when I moved to London in 2014 I just knew I had to have my own business. It all started by co-founding Kisha, world’s smartest fashion tech umbrella and until today our umbrellas have been sold and shipped to more than 40 different countries. 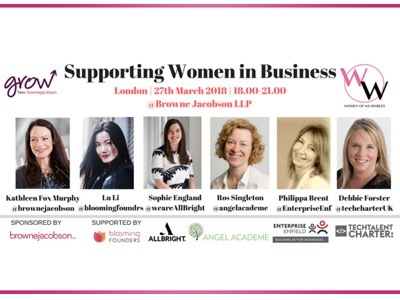 After realising potential of wearable tech industry and lack of women in it, my co-founder Michelle and I decided to start WoW and empower and support women who already are in this industry, but also those who still struggle where to start. Michelle: The greatest challenge in being my own boss is finding the time to do everything and be everywhere. Being a sole founder and CEO means you are the Chief Everything Officer. The greatest reward is meeting inspiring people every day, seeking new opportunities and being a STEM Ambassador especially to young girls. I have the freedom to make decisions according to my goals for the business and for the wider community. Marija: Greatest challenge is wearing multiple hats all the time and managing my time effectively. Having multiple businesses and projects requires me to be super organised. The greatest reward is having my own freedom to do things when I want and how I want, being able to travel and work at the same time, which is a commodity not many people today have, and also making more impact now I have my own business. Michelle: It is so easy to work “in” your business every day that sometimes it’s necessary to take a step back to work “on” your business. Every week, writing down your to do list and ticking them off as you go along helps you look back and recognize your achievements. This is a reminder that when there are failures, these achievements are little successes that will help you get to your end goal. They might be just enough to keep you going because running a business is hard. It’s difficult to see the successes when all you’re focusing on is getting to the end goal and questioning why you aren’t there yet. Marija: I used to stress out a lot if I wouldn’t tick off all the boxes on my to-do list before. Not any more. Now I have more smaller goals and focus on not more than 3 things in a day. I also try to dedicate at least two days per week on actual working, which means no meetings, no events, just me and my laptop. Learning to say ‘no’ is very important, too. Not every opportunity is the right opportunity. When it comes to failures, I see them as part of my learning process, so I always try to understand what could be improved for the next time. Failures are okay if they make you stronger and bring you useful experience which can help you in the future. Michelle: Saying no is difficult because I don’t want to miss out on any opportunities or let anyone down. However, I’ve learnt that saying no means I can focus on my goals and vision for my business Made With Glove and for WoW. Marija: I would say that finding a good team, especially co-founder, is crucial. There’s nothing worse than sharing your everyday office life and your work with the wrong people, and nothing better than knowing you can rely on your co-founder when it gets tough. Michelle: Being a sole founder and constantly making decisions is tiring. My mentor helps me gain perspective when I’m overwhelmed with so many things to do. I can build my own relationships and networks in the industry. The tech industry is male dominated so having a female mentor to guide me as I navigate this new industry is really helpful. Marija: Although I don’t have a mentor, I have mentored many startups and individuals over the last few years and that experience actually helped me figure out what are do’s and dont’s in entrepreneurial world. I also read a lot, mostly business books which proved to be really helpful, too. Michelle: Networking comes in many ways both formal and informal so always be ready to seek opportunities and make connections at any given time. Marija: I always say that my biggest and most important asset is my network. Whenever you can, try to meet someone new and even if that person is not directly connected with what you do, there is always something you can learn from them. Michelle: Having a great support network is crucial as well as a great team who can help me scale and grow my business. It is only by having a great co-founder for WoW and staff that I can rely on to allow me the time to do the things that I’m better at. The real value is having a great team that I can trust to help me achieve my goals. Growth takes time and being patient and organized is key to planning for growth. Marija: Scaling a business is harder than people usually think. We all read about those big business successes, but what people forgive is that overnight success usually comes after ten years. It’s better to go at slower pace and have a constant growth, than rush and then drain yourself. Prioritizing is very important, so finding the best team and then growing gradually is the best option, I think. Growth brings experience and wisdom, and we all must remember that business is something that never stops growing, and we never stop learning. Michelle: I’m very excited about the future in particular for the wearables industry. It’s a new industry and being a part of that is very rewarding. I also have the opportunity to help shape its future through WoW because we are inspiring, supporting and connecting the current and the next generation women in wearables, IoT and AR/VR. Sharing it with my WoW co-founder Marija and my wearable tech assistant, Rachael makes the journey more exciting. Marija: Many beautiful things, I hope. Wearable Tech, Fashion Tech, IoT and VR industry will grow a lot over the next few years, and being part of those industries enables me to shape not only my own future but also have impact on them. I’m a big advocate for getting more women into tech, which is the very reason I started WoW. My big passion is travelling, which I try to do whenever I can, together with my husband. Being an entrepreneur offers me that freedom, so taking the best from both worlds is what makes me truly happy.